The local news gossip line was bubbling over with tales of hundreds of Pontelandolfese returning to their roots. Word was that a bus would show up in the piazza on Sunday, September, 6. In past years, we have bumped into returning Pontelandolfese from Montreal, Venezuala and of course Waterbury Connecticut and its suburb Watertown. It is always interesting to hear them speak Italian – it is the ancient dialect of the folks who left Pontelandolfo in the mid to late 1800’s. Language over the years has evolved but the people who live in these Italian American communities retain this historic form of speech. I enjoy listening. The bus landed – I mean pulled up – and with pen in hand I waited to see the influx of visitors. Did I count 12? That is a really big bus. A local pointed out that in years past the buses would be packed. I also noticed that there weren’t any young people on the bus. Hmmmm. 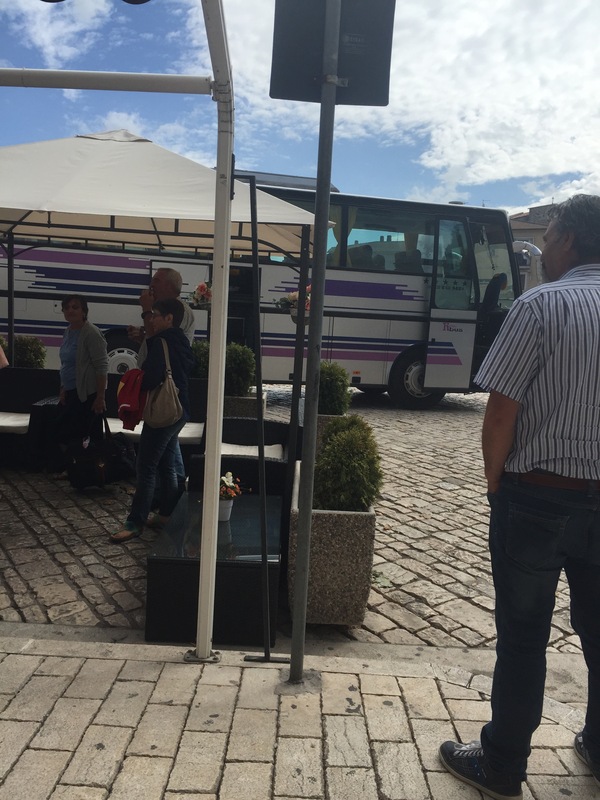 The bus let the group off at Bar Elimar where a welcome drink and snacks were available. Il Sindico Rinaldi was there to greet them and everyone was mingling and whipping out cell phones for photos. But, but, there had to be more people – where are they? I took a deep breath and walked up to one of the women. She reminded me of my cousin Janet. I introduced my blog and the charming Louise answered all my questions. She explained that the plane was full of people from Waterbury and Watertown Connecticut. I asked if the trip was organized by the Pontelandolfo Community Club and she said it had been. Not only was the plane full – we are talking a couple of hundred people on this trip – but she also said there were indeed some young people. Since the majority of people on the trip still have extended family here they were picked up in cars. Ahhhh – that solves the bus mystery. The Pontelandolfo Community Club sits on 35 acres in Waterbury. You have to be able to trace your bloodline to Pontelandolfo to join. My dad joined but since it was a 3 hour drive from NJ he never went to a meeting. We did go up to their Festa di San Donato twice. The facility is amazing – they even built a replica of the Piazza Roma fountain. Why are there so many Pontelandolfese in the Waterbury area? Looking for work and opportunity men came to Waterbury and discovered the brass mills. There was a need for laborers in those factories and others. The word trickled back to Pontelandolfo and more men followed. These immigrants established the Pontelandolfo Society in 1930 and the Pontelandolfo Social Club in 1939. These two clubs merged in 1965 to form the Pontelandolfo Community Club. Twenty years later in 1985 the Ponte Women’s Club was formed. Whoa – it wasn’t until 1985 that the women had an organization? I bet they still cooked for all the parties before that. This enthusiastic group is here for two weeks. I hope the travelers have a glorious two weeks visiting family and checking out our new Pontelandolfo 1861 project. After talking to this nice woman from Watertown, I handed her my Nonna’s Mulberry Tree Card. She read it and said, “Guerrera – that’s my name! Of course, of all the women getting off the bus I would walk right up to the Guerrera. As my Zia Giussipina always says – “blood calls the blood” – and all roads for Pontelandolfese lead back to Pontelandolfo. Sounds like the beginning of a great mystery novel. Wow, a community that stayed together when they came to America and come back by the plane load to visit the old country.. Love it. So was she a relative? Don’t leave us hangin’ here, Midge! Ike Smith. There are a number of branches.